The Cape Cod Square Planter features a bead board panel design with rich architectural details, truly transforming your patio space into your own personal retreat. Constructed from 100% polyethylene which delivers an incredibly strong and remarkably lightweight planter. The weather-proof and ultra-tough construction allow you to enjoy your planter all year long with very little winter preparation. The UV inhibitors within the resin allow for long-lasting fade-free performance. This planter enhances the presentation of your plants without competing with them, perfect for multiple plants and larger arrangements. 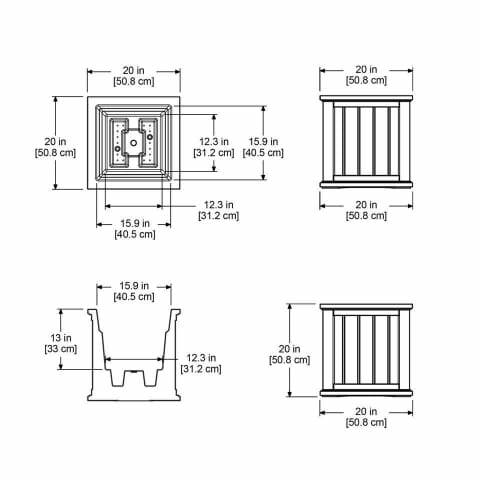 In addition, the Cape Cod Square planters are designed with a double wall construction which creates a water reservoir. This helps retain the right amount of moisture in the soil and protect delicate roots from daily temperature extremes. This results in healthier plants that require less frequent watering. The weather-proof and ultra-tough construction allow you to enjoy your planter all year long with very little winter preparation. The UV inhibitors within the resin allow for long-lasting fade-free performance.